Living in a town where being horsey is not the norm, I have often been challenged with this question, by others and even myself. It’s hasn’t been the easiest path, to live the equestrian lifestyle. Attempting to explain it with words usually leaves me disappointed that I can’t more eloquently answer this question and fully explain my inherent need for this world. Only those who were born with horses in their blood can fully understand this grand passion. It runs deep in the soul and saturates the heart. Horses are analogous with all that the beholder deems most precious. The barn truly is an extraordinary place, the perfect juxtaposition of simplicity and luxury. I adore every aspect of being at the barn…the soft sound of horses munching their feed, barn girls giggling, the rain tapping on the metal roof, the low hum of country music in the background. The divine smell of horses, leather and hay all blended together. A crisp white saddle pad. Freshly oiled saddle. The barn is a place where you are free to be who you are whatever it may be that day. Horses see you for who you are at your core and don’t judge you if you are having a bad day or say the wrong thing. When I’m at the barn life just makes sense. Everything stressful or complicated just melts away with a soft nuzzle and the flick of a brush. My horse knows all of my struggles and all of my dreams. All of this is well worth the hefty price tag. It must seem strange to the people that see me around town after I’ve been at the barn, stomping through the grocery store with my muddy boots, breeches and dusty mess of hair. On an average day I like to wear makeup and make sure that my hair is blow dried and styled. I love my designer handbags, jewelry and heels…but when it comes down to what really matters I would choose the muddy boots and messy hair in half a heartbeat. 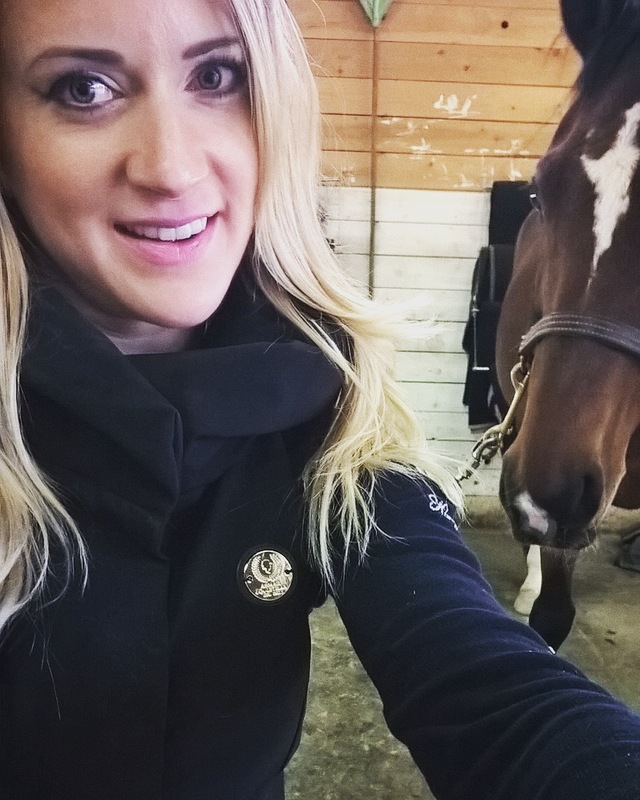 As a mom with a family to care for and a job, my hours at the barn are stolen treasures. I soak up every delicious moment I can spend with my horse. So many obstacles in my equestrian journey and in life come down to the same lessons. It truly is a partnership that involves give and take on both sides, like a dance, and the journey is sometimes smooth and other times extremely frustrating. On a good day, my horse is forgiving and takes me over the jumps ensuring that I stay safely in the saddle despite my many mistakes. On a difficult day, we might struggle to walk in a straight line and get in a decent trot. The more I let go of my fears and give in to trust, the better my horse is—she’s more responsive, supple, connected and adjustable. I recently competed in my first Hunter/Jumper show and totally bombed it. I forgot all of my courses and what we’d been practicing at home. My nerves got the best of me and I just couldn’t pull it together. I almost died of embarrassment to have failed in front of so many people. But you know what? My horse was incredible. She was patient, kind, willing and responsive in the show ring. She took amazing care of me, as if to reassure me that she was there for me and we would get through it together. Having this experience really helped me gain confidence in us as a team. Maybe my days showing aren’t over just yet. My greatest sense of accomplishment comes from riding my horse. Horses feel your energy, and together you become one. Every moment of hesitation, anxiety, fear, confidence, joy, excitement…your horse translates that energy in motion, and together in unison you experience that delicious, indescribable feeling of power, grace and freedom that we horse lovers live for. After any ride, good or bad, I come away feeling triumphant. I was gifted with yet another day to live out my dreams and follow my passion. So why do I need horses in my life you ask? You might as well ask me why I need my own heart. 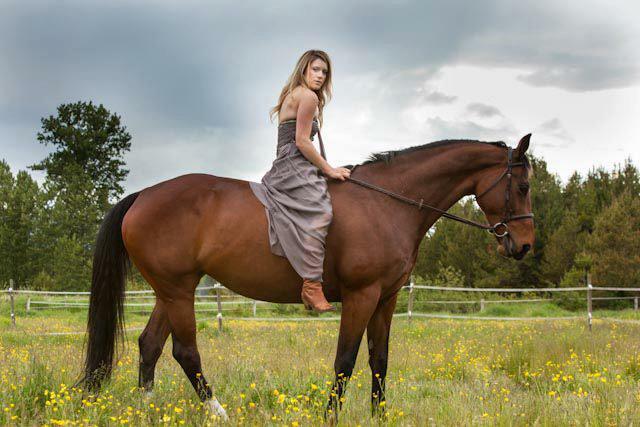 Stephanie Coulson is an amateur Hunter/Jumper rider, living and loving life on the West Coast of BC with her husband, three year old daughter, and Dutch Warmblood mare, Jada.